As most of my readers know I'm in my early 50's, and I use and try out a lot of products trying to battle the ticking clock. I am battling the aging process as well as the actual ticking clock. I like to find products that actually make me look and feel younger as well as one's that aren't too time consuming to use. This product falls into both categories. CoolingTech Makeup Brushes Set (10-Pieces) is a nice make up brush set. 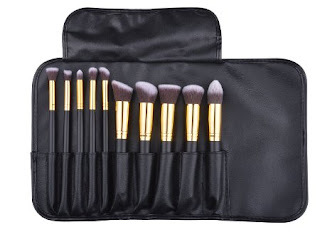 There are 10 different brushes, all with synthetic bristles that will not shed. They are dense, but very soft on your skin. The wooden handles fit well in my hand. They store nicely in the roll up storage bag that comes with them. I have been watching a lot of make up tutorials to learn how to use each brush correctly. It is amazing what properly applied make up can do, it's magic! Having the right brushes to apply it with..priceless! They're beautiful. How soft are the bristles?